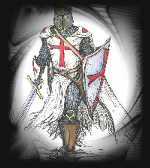 Knights Templar UK "Helping to reclaim our once great nation and to help our most vulnerable"
Mysteries, legends, adventure and myths, the history of the Knights Templar has it all. It has one of the most recognisable symbols in the world today, the red cross. In 1128 Pope Honorius II assigned the templar Knights the white mantle of the Cistercians, on which they wore the red cross with square ends. However in 1147, Pope Eugenius III ordained the use of the 'Eight Pointed Cross', which has been used by the Knights Templar ever since. But, who are the Knights Templar ? Few people really know, and on this site we give a brief history of the order, the power they held, what they have become now, and details of how you, as a citizen , can, by becoming a member, help the United Kingdom, be more the place you want it to be. Compared to other Knights Templar organisations, it's likely you'll find our organisation is more "forward thinking" to achieve our aims, with a few modern adaptations, are attempting to fight for what the original Knights Templar, were actually formed for. Think about this : The original Knights Templar were formed as a Christian Military Order to protect pilgrims visiting the Holy Land. Because of little or no armies and lack of defence, many European countries then hired the Knights Templar to fight against the march of Islamic migrants becoming dominant in those countries. All this was happening in the 11th, 12th and 13th centuries. Protecting ones faith ? Not wanting to be governed by others ? Lack of proper defence ? Ever growing march of immigrants ? Ring any bells ? If you genuinely care about preserving the British way of life, don't just moan about the injustices being done and then do nothing, because doing nothing, allows them to happen ! At least try to do something about it and maybe join our ever growing membership. Our increasing family of sisters and brothers who fiercely care about one another and our Nation. With Area Commanderies throughout the UK. We regularly meet up to help recruit, share petitions, socialise and visit historical places of interest. We like to help out in our communities and help as many people as possible. Whether it is giving our time, any act of kindness, no matter how big or small, touches someone. On a regular basis, we give money for good causes and various charities. We find it incredibly sad that people confuse patriotism with racism and we definitely want to clarify the difference. We are NOT right wing and hate speech is not tolerated in any shape or form within our organisation. Join us and help make a difference and a positive impact in making our Nation great once more. In addition forming lasting friendships and support along the way. The KTUK Anthem. Click here to download.